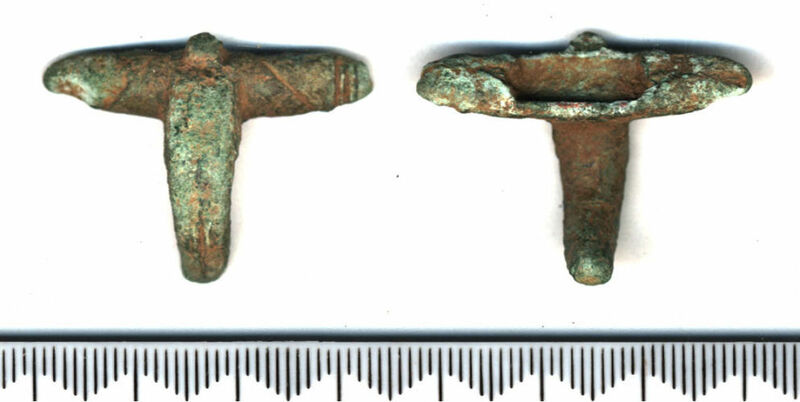 Copper alloy brooch fragment, Polden Hill variant. Upper part only, missing spring, pin; very corroded. Wing terminals have 9mm wide flaps folded around the axis bar; the spring chord was held by a rear hook, now largely missing. The wings are decorated with single diagonal grooves and a group of three at the terminals. The bow is oval in section and has at least one central groove. Width 33mm, surviving length 23mm. Type as West Stow no.160, ADT 038 has similar wing decoration.